Whether you’re partial to a rich, chocolatey devil cake or prefer to savour a more mature cheesecake, doused in liquor, there’s no better way to end a meal than with a slice of your favourite cake. Not all cake recipes are for dessert, of course. Let’s not forget the joy of waking up to the smell of fresh pancakes or the excitement of blowing out the candles on that extra special birthday sponge cake! Cake is a call for celebration, a food to share with friends and family, or enjoy a single serving as a treat. There’s a cake recipe for everyone, from food connoisseurs to sweet-toothed dessert lovers. Cake has been delighting our taste buds for centuries. From the tough Vikings to tragic Greek poets, everyone’s had their heart melted by a delicious slice of cake. Butter is as essential to a modern cake as flour. Even in ancient Rome, bakers would add butter to create an enriched bread dough, so sweet and soft it was considered a treat. However, not all cake recipes have remained the same over time. While our ancestors used honey, carrot and other sweet vegetables to sweeten their cakes, we now use sugar to create super light sponges and perfectly sweet icing. Modern cakes are a staple in every home! From moreish chocolate cakes to extravagant Victoria sponge cakes to tiny fairy cakes, we love spending an afternoon in the kitchen with simple cake recipes. Butter and cake go hand in hand, from fluffy butter icing to melted cubes of golden buttery-ness sliding down a stack of pancakes. The best butter for baking cakes of all kinds is unsalted butter. 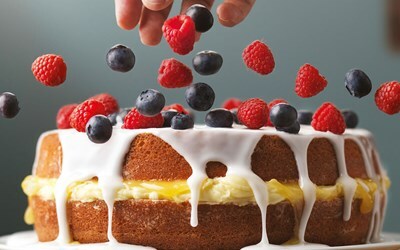 For cake recipes, make sure it’s softened by leaving it covered on the kitchen worktop or, if you’re feeling brave, try microwaving cubes of butter on and off for a few seconds until softened. Don’t forget to weigh out how much butter you need instead of microwaving the entire block! A buttery icing or filling can save a dry cake when smothered between sponge layers or skilfully piped across the top. Leave the butter icing in the fridge for a few minutes to firm up before piping, so your beautiful icing designs stay put. You can’t go wrong with a classic lemon drizzle cake! Try out zesty lemon cake to discover that perfect balance between sour lemon and sweet butter cream. This cake recipe is ideal for beginners and includes lemon syrup to drizzle over. We think breakfast is the perfect opportunity to enjoy some cake! Our breakfast cake recipe is American pancakes. These fluffy alternatives to British pancakes make a hearty breakfast, lightened with a sprinkling of blueberries, lime and pecans. For the ultimate dinner party showstopper, we recommend our light and luxurious berry cheesecake. 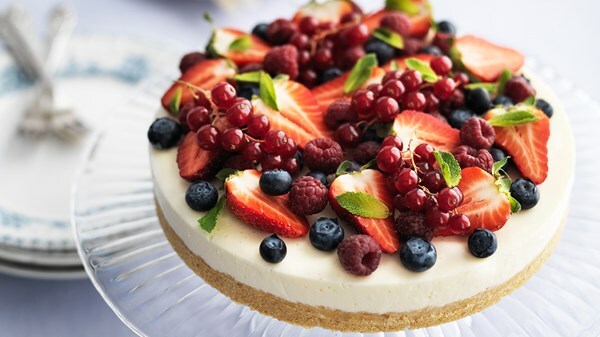 Nothing completes a perfect evening like sharing a slice of creamy cheesecake, topped with your favourite fresh berries.